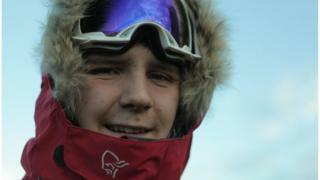 A 16-year-old boy from Bristol has set a new record by becoming the youngest person to trek to the South Pole. Lewis Clarke spent 48 days at temperatures as low as -50C (-58F) and winds of up to 120 mph (193 kmh). He arrived at the Amundsen-Scott South Pole Station at 18:00 GMT after completing the gruelling 702-mile journey from the Antarctic coast. He will now be submitting evidence to Guinness World Records so his claim can be officially verified. On his arrival, he said: "I'm really happy but mostly relieved that for the first time in 48 days I don't have to get up tomorrow and drag my sled for nine hours in the snow and icy wind. "Today was really hard, the closer I got to the Pole the slower I went, my legs had had enough. "But now I'm here and I've had some spaghetti bolognaise and I am sitting in a heated tent." Speaking earlier in the day when his son was still about 10 miles from the Pole, his father Steven said Saturday's weather had been the "worst yet". The QEH Bristol (Queen Elizabeth Hospital School) pupil is hoping to have broken the record for the same coast-to-pole route taken by Sarah McNair Landry from Canada in 2005, when she was aged 18. He has pulled his supplies behind him on a sledge with help provided by the experienced polar guide Carl Alvey. Problems encountered along the way have included blisters, coughs caused by being at high altitudes, and a broken ski. His record-breaking feat has raised more than £2,000 for The Prince's Trust. Lewis will remain at the Pole overnight before taking a tour of the Amundsen Scott Polar Research base on Sunday. He will then fly back to the Union Glacier base camp and is expected to arrive back in the UK on 24 January.